Canadian melodic extreme fantasy metal band Morvheim from Toronto will release its new full-length album “Airships” in early 2018. Get ready for our most eclectic and -yes- intense album yet. Morvheim dialed back the atmospheric elements in favor of creating something more visceral and riff-based. 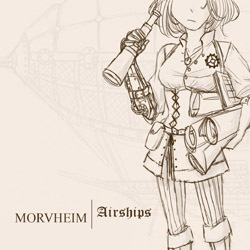 That being said, the dreamy keyboards which have always defined Morvheim are still in full force, and “Airships” has plenty of epicness to go around. The band has just unveiled the cover artwork and the album tracklist. Release date will be soon announced.